One of the best TOUR and ACTIVITY in the CANCUN and RIVIERA MAYA area is XPLOR PARK. 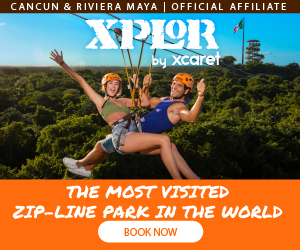 XPLOR is simply the best thing to do in Cancun. The park is located 1 hour from Cancun and 15 minutes from Playa del Carmen, right in the heart of the Riviera Maya. Test your guts on the 14 zip lines circuit, up to 150 feets in the air !! The biggest zip line circuit in all Latin America. Take a swim in the underground rivers surrounded by stalactites and stalagmites while contemplating the rock formation process created by nature millions of years ago. You can also drive an amphibious vehicle through the jungle and as well inside the caves. Food and beverages are included all day long. Xplor puts safety at the forefront of our priority list. Click on the XPLOR image below to reserve right now at the best price. Are you ready for the biggest zip line circiut in Latin America !?! At XPLOR Park you can take a swim in the underground rivers and explor the fascinating formations of stalactites and stalagmites. More than 1 km of underground rivers to be discovered. Discover what happened to the Yucatan peninsula million of years ago. XPLOR is one of the best CANCUN TOUR & RIVIERA MAYA TOUR. Snorkel in the turquoise waters of the Caribbean Sea, enjoy the land and aquatic activities and daze yourself in Xel-Há, the world's most beautiful Natural Aquarium. Live the best adventure swimming among ancient rock formations and paddling through caves and caverns in Xplor.